A: Welcome to “Food Delight”, where we bring you new culinary tips to help you enjoy yourselves in the kitchen. We’re A and B saying hello to all our lovely foodies. A: The goat cheese melts in with the pasta creating a flavorful and creamy dish. When the temperature drops, and it’s dark and cold outside, what would be better than to just curl up on the couch with a blanket and taste this super comforting pasta? Pretty sure that could make winter way more bearable and even enjoyable. B: Agreed. I’m not the biggest goat cheese fan but I loved goat cheese pasta the first time I tasted it. It’s perfect for those of you want to spend less time in the kitchen and more time relaxing. This pasta comes together so fast with these simple ingredients: goat cheese, sun dried tomatoes, asparagus, mushrooms, and pasta. A: Sun-dried tomatoes are quite easy to make at home. It"s a great way to preserve tomatoes after being picked or bought from supermarket. Simply slice the tomatoes in half, place on a flat surface, lightly sprinkle with salt and place in the hot sun until dry. A: I’ve noticed that, with pasta using chicken, people tend to use chicken breast instead of chicken thigh. It’s easy to understand as chicken breast is actually a healthier and leaner choice. B: But, chicken breast tends to dry out when cooked, leaving dry, chewy meat rather than the chicken thigh, which is succulent and juicy. So, overall chicken thigh is the better choice. B: This pasta is best enjoyed fresh. If you cook too much, the left-overs can be stored in the fridge in 1 day before re-heating. A: This creamy Pasta is so amazingly delicious and satisfying that you will definitely want to make it again and again. 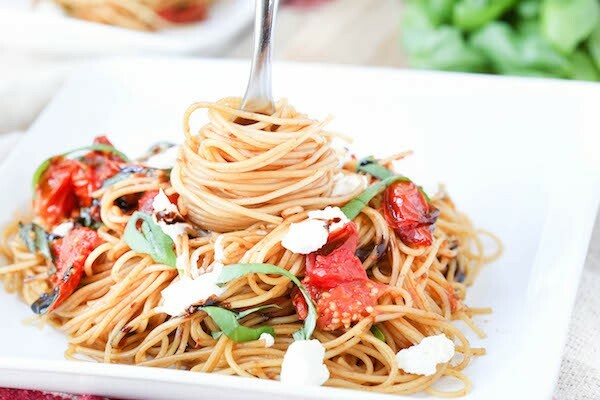 If you give this Goat Cheese Pasta a try, let us know about what you think by leaving a comment and rating it. And don’t forget to take a picture and tag it on our Facebook at VOV5 English Section, hashtag VOV#FOODDELIGHT#ICANCOOK#. We always love seeing what you come up with. B: This easy pasta dish has been a favorite of ours and I think you will enjoy it too. Join us next week for more tips on how to add some zest to your menu. Take care!